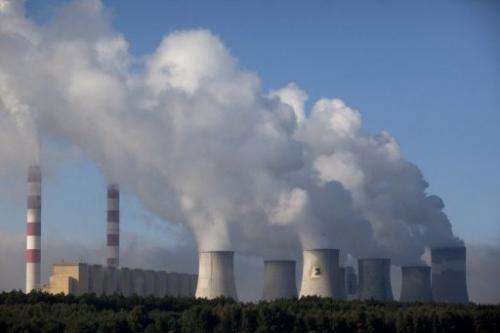 A view of the coal-fired Belchatow power plant on September 28, 2011 in Belchatow, central Poland. Central European powerhouse Poland will anchor its energy strategy in coal and shale gas, with only limited investment in renewables, Prime Minister Donald Tusk said Tuesday. "We want to have renewable energy sources, but hard coal and lignite—and soon shale gas—will remain our principal energy sources. That's where the future of the energy sector lies," Tusk told reporters. "...we've decided that renewable energy sources, which are an important complement to Poland's energy sector, will be limited as much as EU rules will allow," he said. Tusk also voiced optimism that new technologies allowing for cleaner coal-fired plants would be key to Poland's strategy. Last month, Lane Energy Poland—controlled by US energy giant ConocoPhilips—began shale gas extraction at a test well in northern Poland.